A member of the never-before-seen Ocampa species, the young, delicate Kes is Voyager's resident blond beauty - but she's already spoken for. 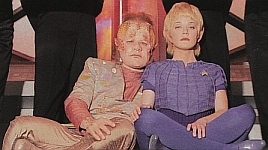 In a quirky, unexpected romantic twist, the show's creators have mated the character - played by former Another World star Jennifer Lien - with the lovable con man Neelix. According to executive producer Rick Berman. "Neelix adores Kes but is insanely jealous. She doesn't give him any reason for those feelings but, whenever he can't find her, he's sure she's somewhere in a closet with a sailor." Somewhat the "artiste" type, Lien (who also co-starred in last season's Phenom) is not comfortable being grilled about Voyager. "I get so emotionally involved in the character I play that I can't articulate well. All I know is I'm going to have a remarkable time playing her." But for how long? As viewers will learn, Ocampa only have a life expectancy of nine years. "It's not as if she'll have a clock ticking over her head," insists Lien. "This is not a foreboding dilemma that limits the character. If anything, it opens up possibilities." Just one question. 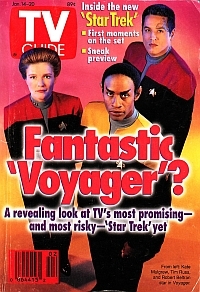 What if Voyager runs 10 years?